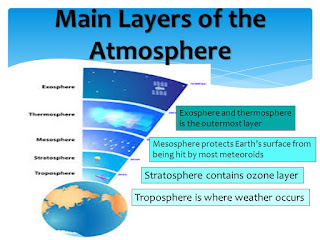 Earth's Atmosphere Layers: The Earth's atmosphere is divided into 5 layers. It is thickest near the surface and thins out with height until it eventually merges with space. Moving upward from ground level, these layers are named the troposphere, stratosphere, mesosphere, thermosphere and exosphere. The exosphere gradually fades away into the realm of interplanetary space. Troposphere: The troposphere starts at the Earth's surface and extends 8 to 14.5 kilometers high. This part of the atmosphere is the most dense. Almost all weather is in this region. Stratosphere: The stratosphere starts just above the troposphere and extends to 50 kilometers high. Commercial passenger jets fly in the lower stratosphere, partly because this less-turbulent layer provides a smoother ride. The jet stream flows near the border between the troposphere and the stratosphere. The ozone layer, which absorbs and scatters the solar ultraviolet radiation, is in this layer. Mesosphere: The mesosphere starts just above the stratosphere and extends to 85 kilometers high. Most meteors burn up in the mesosphere. Unlike the stratosphere, temperatures once again drop as you rise up through the mesosphere. The coldest temperatures in Earth's atmosphere, about -90° C (-130° F), are found near the top of this layer. Thermosphere: The thermosphere starts just above the mesosphere and extends to 600 kilometers high. Aurora and satellites occur in this layer. Exosphere: The atmosphere merges into space in the extremely thin exosphere. This is the upper limit of our atmosphere. The exosphere is the most distant atmospheric region from Earth's surface. In the exosphere, an upward travelling molecule can escape to space (if it is moving fast enough) or be pulled back to Earth by gravity with little probability of colliding with another molecule. The exosphere is a transitional zone between Earth's atmosphere and interplanetary space.